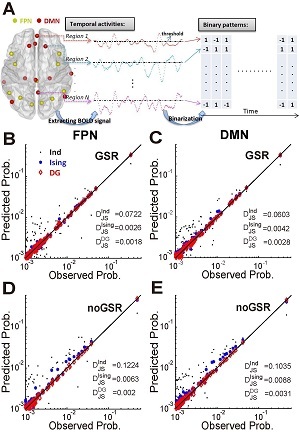 Weak Higher-order Interactions in Macroscopic Functional Networks of the Resting Brain. Huang X1,2,3,4, Xu K1,2,4,5, Chu C1,2,4,5, Jiang T1,2,4,6,7, Yu S8,2,4,5. National Laboratory of Pattern Recognition. Research Center for Brain-inspired Intelligence, Institute of Automation. CAS Center for Excellence in Brain Science and Intelligence Technology, Chinese Academy of Sciences, Beijing 100190, China. The Queensland Brain Institute, University of Queensland, Brisbane, QLD 4072, Australia. 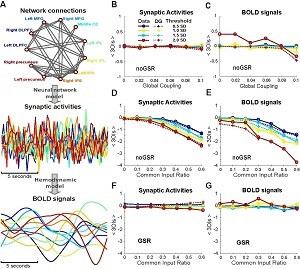 Interactions among different brain regions are usually examined through functional connectivity (FC) analysis, which is exclusively based on measuring pairwise correlations in activities. However, interactions beyond the pairwise level, i.e., higher-order interactions (HOIs), are vital in understanding the behavior of many complex systems. So far whether HOIs exist among brain regions and how they can affect brain's activities remain largely elusive. To address these issues, here we analyzed blood oxygenation level-dependent (BOLD) signals recorded from six typical macroscopic functional networks of the brain in 100 human subjects (46 males and 54 females) during the resting state. Through examining the binarized BOLD signals, we found that HOIs within and across individual networks were both very weak, regardless of the network size, topology, degree of spatial proximity, spatial scales and whether the global signal was regressed or not. To investigate the potential mechanisms underlying the weak HOIs, we analyzed the dynamics of a network model, and also found that HOIs were generally weak within a wide range of key parameters, provided that the overall dynamic feature of the model was similar to the empirical data and it was operating close to a linear fluctuation regime. 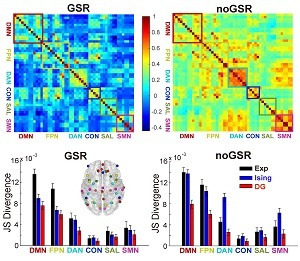 Taken together, our results suggest that weak HOI may be a general property of brain's macroscopic functional networks, which implies the dominance of pairwise interactions in shaping brain activities at such a scale and warrants the validity of widely used pairwise-based FC approaches.SIGNIFICANCE STATEMENTTo explain how activities of different brain areas are coordinated through interactions is essential to reveal the mechanisms underlying various brain functions. Traditionally, such an interaction structure is commonly studied by using pairwise-based functional network analyses. It is unclear whether the interactions beyond the pairwise level (higher-order interactions or HOIs) play any role in this process. Here we show that HOIs are generally weak in macroscopic brain networks. We also suggested a possible dynamical mechanism that may underlay this phenomenon. These results provide plausible explanation for the effectiveness of widely used pairwise-based approaches in analyzing brain networks. More importantly, it reveals a simple organization of brain's macroscopic functional systems that is previously unknown.